Carlos (as he is known to friends) is a walking dichotomy, being both an enigma and an open book. The mystery is the man’s nearly unfathomable knowledge of all things guitar. The known is his friendliness, willingness and eagerness to share his knowledge and experience. Watching him interact with his lovely wife Jeannie, or seeing him play with his dogs Joey and Zeke provide invaluable insight into the makeup of a fellow who is as comfortable creating a world-class stringed instrument as he is leisurely strolling a path lakeside near his Georgia home. 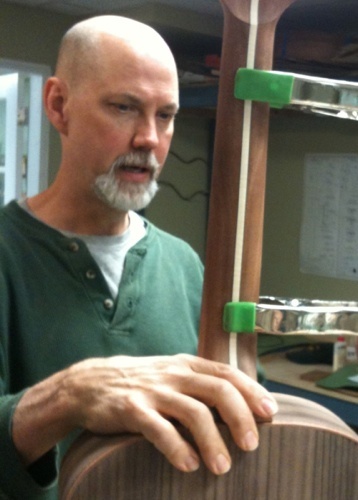 Tall, slender, fit and active is how I would physically describe the luthier who opened up his home and avocation to me. Warm, witty, anecdotal and humorous is how I would dare attempt to begin to explain the personality of someone whose art can be actualized, nay, felt. Carlos is quite clear regarding what he is all about, which is “to promote hand made acoustic musical instruments and home made living room music”. Having spent a week with him I can attest that his true mission is to set ablaze a musical experience in wood that leaves one hungering and panting for more! By raising the proverbial bar for what a guitar should feel and sound like, Carlos is at once elevated into that elite class of artisans who walk the talk. 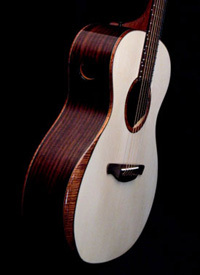 After decades of supplying performers, singers, songwriters and collectors with befitting tools, Carlos was determined to produce an instrument worthy of his legacy while remaining affordable (I believe that the unique paradox of the end game of a master craftsman is no better denoted than by producing the very best product available anywhere while potentially pricing oneself out of the market). The culmination of years of experience, love of the craft and determination to be economically viable resulted in a limited release model known as the Sofia, the first guitar he has made in the last decade to sell for under $5k. The Everett pedigree is all over this instrument, visible in the stepped headstock and stepped soundport, painstakingly voiced top, and his original transitional arm bevel he developed back in the early 1990’s. 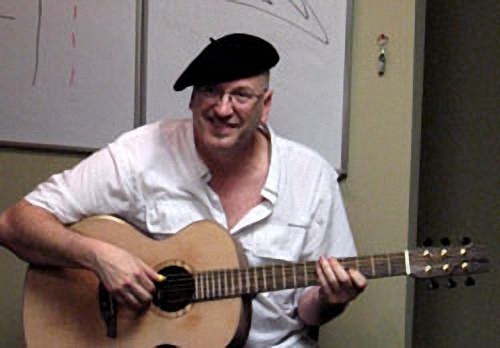 This was the first Everett guitar I had ever played. I was immediately smitten with it’s sound. And this was the model of guitar I participated in building over a six day master / apprentice oriented course. Next on the instruction list was the guitar top, or soundboard. Much time was devoted to gaining an understanding of how the various factors of the top (wood, thickness, bracing, radius, scalloping, etc.) all come together to deliver the single-most defining element of the guitar’s overall sound. The soundboard wood in this case was Western Red Cedar, often described as warmer-sounding when contrasted with the more commonly used Spruce(s). 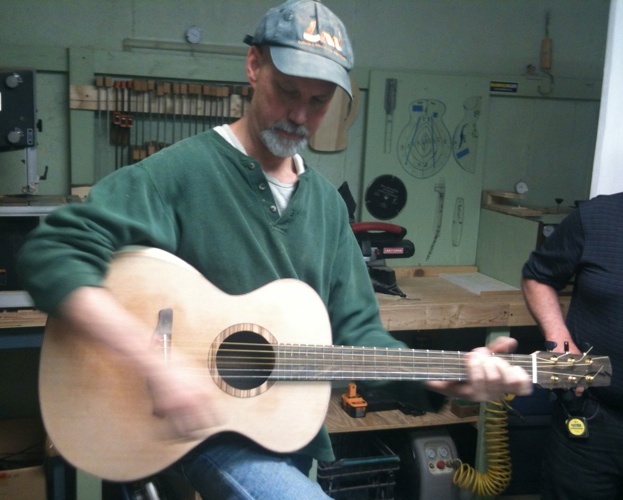 The soundhole was cut, the rosette glued in place, and the top was reduced in thickness to that critical point. When completed, with braces and bridgeplate carefully and articulately glued in place, lightly running one’s fingertips over that top produced a crisp, almost crackly, rasp-like response that built anticipation. Once the soundboard was attached, much care was taken in beveling the lower bout’s edge of the body where the player’s arm would drape across the side and top comfortably. With the soundboard and back assembled to the sides, a guitar body emerged. But as soon as the edges were carefully routed to accept binding and purfling the sound literally died! Not to worry, this phenomenon is quite expected, and demonstrates the significance of the relationship(s) between components. From this stage, the guitar went together very quickly, and it was impressive to witness the role that each piece of construction played in the final outcome. The Bubinga chosen for the binding was a strong color contrast to the marriage of Rosewood and Cedar, lending a degree of visual separation that speaks to an artist’s eye. 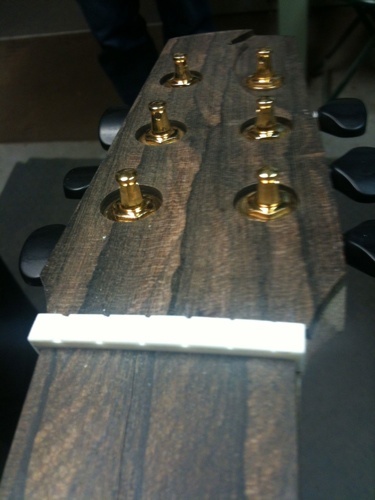 Most impressive was the return of the responsiveness of the soundboard to the guitar body once the binding was in place. Next up was the guitar neck, that tree limb of a handle that can support 150 to 200 pounds of tension while presenting a canvas for the most nimble and deft fingerings to paint. Assembled to be strong enough to resist the pull of 6 separate pieces of steel working to bow it in half, the neck was carefully shaped, straightened and fitted to the body so as to suspend the strings the perfect distance from the wood. This is no small feat, and the topic of countless books, DVD’s and lectures. 6 days goes by pretty fast when you're having fun. If there can be greater fun than doing what you love, perhaps it is doing what you love alongside someone like Kent Carlos Everett. During our time together, I recall a rather significant ‘Aha!’ moment (and there were several of those, that week), where the lights went on regarding a particular lutherie issue I had struggled with. My enthusiasm over what was suddenly (as a direct result of this man's teaching) such an obvious path to follow, triggered him to reflect, “You realize it took me 35 years to learn that, and here I am, giving it to you”! With the enormity of the moment weighing upon us, I responded, “Yeah, well I don't have 35 years to learn it”! We laughed and moved on to the next revelatory moment. Thank you, man, for opening your shop and your home and for sharing such a wealth of information with me. It was an invaluable time invested. I trust that I can build instruments worthy of your approval.